This being exactly mid-February in our commercialized world, I’ve been spotting a lot of those fat cherubs flyin’ around with bows and arrows of late. It got me wondering about that baby/weapon combo which, you have to admit, is not exactly normal. Give that baby a few years of hanging on to that bow and arrow and what you get — probably because of Hollywood — is the stuff that makes many a man and woman, well, quiver, not to mention prompt law enforcement officials into action. Yup, it’s a lot easier now to think of a bow and arrow as a cute toy wielded by Cupid, or an eccentric’s collectible. The days of Egyptians guarding the pharoahs, Genghis Khan‘s plundering hordes, and Comanche sharpshooters launching arrows from behind the flying mane of their mounts are well behind us. Still, it’s within living memory that a man named Ishi routinely used a bow and arrow. 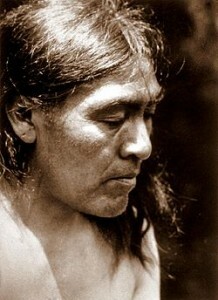 He’s widely seen as the last of the Yahi people, said to be pretty much finished off by starvation and the gunfire of a bunch of gold-hunting, “go-west-young-man” settlers in California. Seems his technique is still regarded as something pretty clever. But where does that leave us now with our understanding of bows and arrows? Well, what we know waffles between the cuteness of Cupid and the sporting realm. That we still know anything about their use is probably due to those Cowboy and Indian movies, the Olympic Games and Valentine’s Day. Is that a sign of an advancing civilization?